Rated: PG-13 for the only silent way to swear and a few disturbing images. The opening scene of The Artist, a mainstream delight shot in a very classical matter, is one of the film’s many in-jokes, as we see a handsome man being electrocuted in a chair. “Talk!” scream the men torturing him. Well, they don’t scream it—a title card tells us that’s what they are shouting as their mouths open but we here only the chimes and whistles of Ludovic Bource’s score. Soon enough, the film cuts out to a full-house theater watching the silent flick, but the illusion doesn’t stop. When the audience screams, the only sound is violins, and when the applause comes at the end, we hear only the joy of silence. The Artist is an homage to the good ol’ era of silent filmmaking made in the style: black and white, 4:3 aspect ratio, title cards for dialogue, and (save for two smartly used sequences) only music to take us through the narrative. It is of course also an extremely self-aware film, following two movie stars at transitional periods of their lives in the heyday of Hollywood. The director behind this project, however, is a Frenchman named Michel Hazanavicius, and the two stars, Jean Dujardin and Berenice Bejo, are French as well. But just because they don’t come from the US doesn’t mean they can’t appreciate the day when words meant nothing and gestures and expressions were at the heart of Hollywood. It’s actually great that the two movie stars of this film aren’t actual stars we’ve come to recognize, because their faces would look so out of place in the day of expressive faces. Mr. Dujardin, tall, mustachioed, and with enough lines in his foreheads for each emotion he needs to reach, plays the aptly named George Valentin, a silent movie star at the top of his career, adored by millions in Hollywood. At the premiere of his latest hit film, an adoring fan (Ms. Bejo) “accidentally” bumps into him and gets a picture of her smooching him on the cover of Variety, much to the dismay of Mrs. Valentin. They angrily fight over breakfast in an obvious homage to Citizen Kane, one of dozens of classic films that are hinted at throughout the film. In turns out the fan is actually an extra named Peppy Miller, and Ms. Bejo plays her like a cross between early Joan Crawford and a Clara Bow-type flapper. Her dancing skills make her a perfect partner for Valentin’s latest movie, and the two have a small moment (Ms. Bejo has an especially adorable scene where she pokes around his dressing room) that neither can forget, even as their careers head in different directions. Father time is ticking away as we cut to 1929, where the boss of Kinograph Films, played by John Goodman, cancels the silents and declares talkies the future. But George won’t do it; he’s a real actor, damn it! Gestures! Emotions! Who needs dialogue!? The Artist has more similarities to A Star Is Born than Singin’ in the Rain, as it slowly becomes a portrait of a tragedy of George as he refuses to open his mouth (the fixation on oral speaking in this film would be Freud shooting fish in a barrel). Meanwhile, it turns out Peppy is a fast-talkin’ actress and the next America’s Little Sweetheart, though her moment with George stays constantly in her mind (her first big film is titled Beauty Spot, a reference to a little dot George puts above her lip to give her an edge). When The Artist delights itself in its cinematic references and love for the old days of talking pictures, Mr. Hazanavicius consumes us with its absolute wondrous score and gorgeous desire for a simpler day of picture in which visuals could tell a story. But it’s also a surface picture by many accounts, and when the film reaches for high tragedy, the story never justifies the intense emotions Mr. Bource’s score suggest, especially when Mr. Hazanavicius substitutes it for the “Love Theme” from Hitchcock’s Vertigo. The use of the Bernard Hermann score in the scene in question not only feels awkward given the context, but also highlights the lack of emotion I felt while watching it. 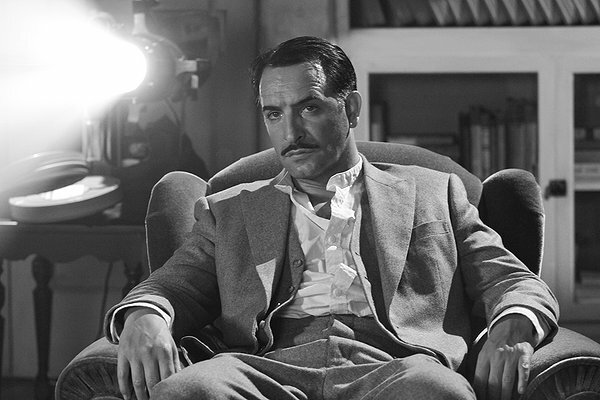 The Artist is so assured in its love for old movies that it doesn’t really appear to be much of a movie itself, and surprisingly it seems to be more in love with Hollywood than actual silent movies. While it is no doubt a joy to watch, it is often better as a reference point to better and more astute films on both Hollywood and the silent era. Thankfully the actors are so delightful. Mr. Dujardin, who already won an award at Cannes for his performance, is not only stunningly handsome and charismatic with only his face to work wit. He has the type of screen presence that no modern actor has with his charming body that commands the screen as he walks across. But for me, the real treat is Ms. Bejo, who just has that type of face that sublimely connects at every moment to the audience. She can be big and emotive for humor, such as when she winks to the audience or blows a kiss to George. When it comes to the messy third half, she brings a little more subtlety than the script probably called for, and keeps us involved. By the time Mr. Dujardin and Ms. Bejo begin tap dancing for our delight, The Artist is a soft ball of a flick that cinephiles eat up like sweet cakes. It’s many times much too easy of a picture, and the attempts at some sort of statement on this era and the transition to sound feels less authentic than the surface delight. But damn if you don’t leave with a smile on your face, as Mr, Hazanavicius reminds you about the faces, gestures, emotions, moments, but never dialogue, that made you first fall in love with the movies.